If you compare this to porchetta, it's an even easier and more straightforward recipe. 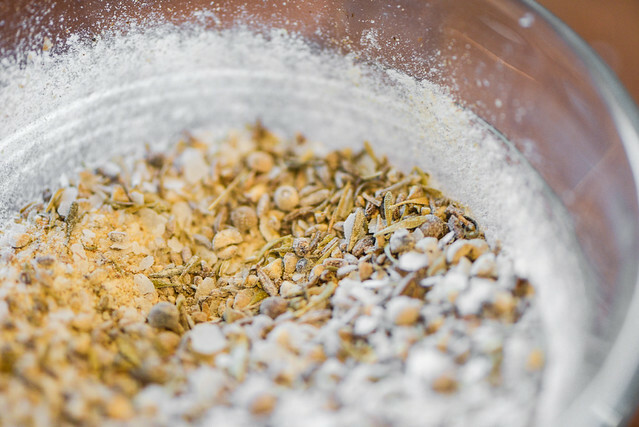 For one, the seasoning was only made up of six dry ingredients, starting with white pepper and caraway seeds, which I had whole and toasted first before transferring them to a spice grinder and pulsing until they were coarsely chopped. I then moved the spices to a small bowl and added in the remaining ingredients—thyme, garlic powder, baking powder, and salt. The baking powder may raise some eyebrows here, and it's use is to aid with breaking down the proteins in the skin which results in an eveny crispier exterior. 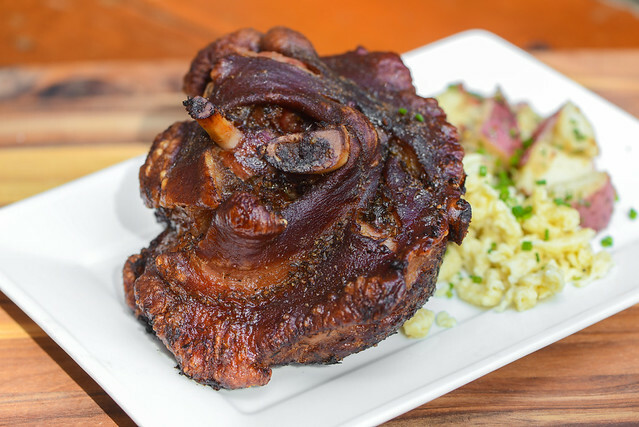 The most difficult part of this recipe was actually finding the pork knuckles. 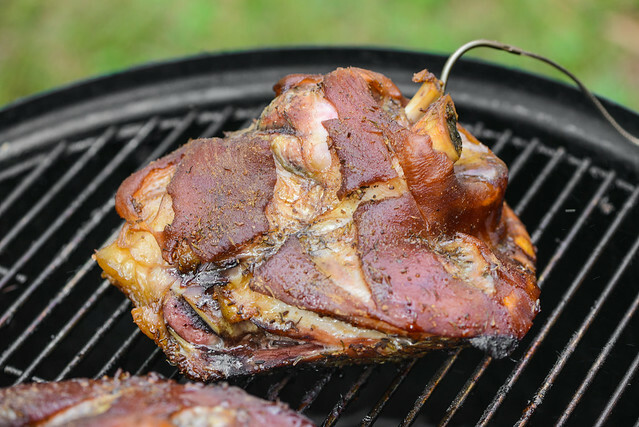 In your everyday grocery store, you're likely only going to find these pre-smoked as ham hocks, but you need a raw, uncooked hock here. The first couple stores I asked couldn't even order them for me, so I went to my most reliable meat source in Durham—the Asian market. I'm not sure why I even bother at the common groceries (unfortunately, we have no true butcher I know of in Durham) when the Asian and Latin American markets have more variety and good quality meats, and sure enough, the market I went to had a pork shank section in their freezer case and I was able to pick up a couple with ease. To prep the shank, I first scored the flesh. I did this so some of the seasoning would be able to get down into the meat and stay there. With porchetta, I had any entire underside of meat to rub the seasoning into, but the same was not true for knuckles, so this seemed like a logical way to ensure full flavor enhancement. Once rubbed down with the spice mixture, I set the shanks in the smoker and monitored the temperature of the meat and pit with my trusty BBQ Guru. I was looking for an internal temperature anywhere between 187-200°F. When doing pork shoulder for pulling, I'm shooting for a higher temperature so the fat and connective tissue has broken down enough that the meat can easily be pulled apart, but because these shanks were destined for slicing, I'd be happy with the lower end of the scale, since that's enough to produce tender and juicy sliceable meat. Once they reached their final temp, they looked mighty fine with a beautiful mahogany skin and a meat that felt super tender to the touch. The only problem was that the skin was still flabby and if you tried to eat at this point, it would have been tough and rubbery. So the next step was to crisp it up, and to do that, I needed high heat. So I moved the knuckles from the low and slow smoker to my grill, which I had fitted with the rotisserie attachment and had a fresh batch of coals ready and outputting maximum heat. 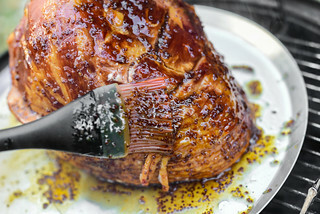 I like the rotisserie here to effectively get all the skin exposed to the heat in an even fashion, and there's the benefit of any still rendering fat coating the exterior, adding even more flavor. 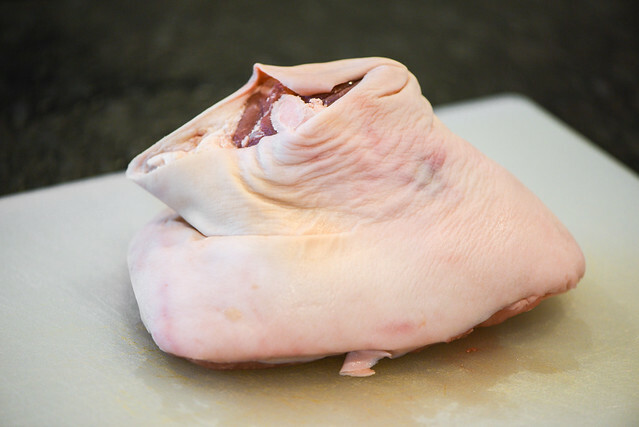 With the skin already well dried out from the long smoking process, crisping went really quick and within ten minutes I had two totally crunchy pieces of pork ready for serving. In good Oktoberfest fashion, we served these with German potato salad and spatzle. I put everything on a plate, set out a knife, and invited my guests to dig in. If you're into crispy pork skin, this is certainly for you. There's a fair amount of delicious and tender meat and fat, but most of the shanks were skin, which was the real attraction for me. 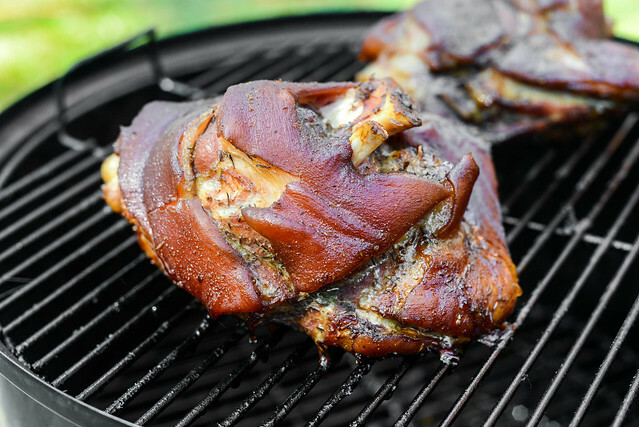 That skin was crackling and so flavorful with a medium smokiness and deep porky character that I think was enhanced by the use of the rotisserie. The seasoning mixture was mellow against the strong pork flavor, but I was able to get a bit of a peppery taste with a mild anise and garlic in the background. It certainly fulfilled on my need for another crispy pork fix with the added bonuses of being easy and timely, a trifecta of a recipe! 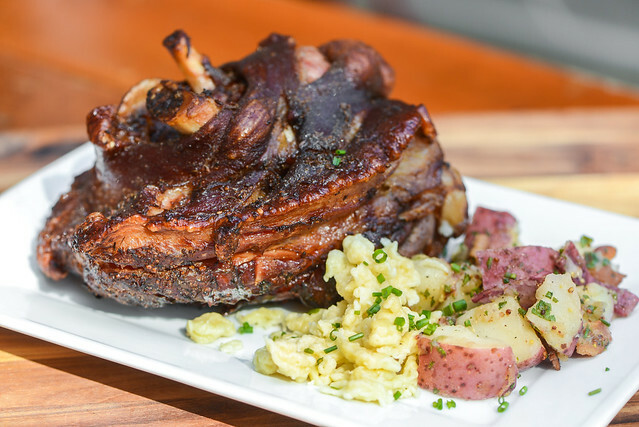 It's all about the crackling pork skin in these roasted, and then crisped, German pork shanks. 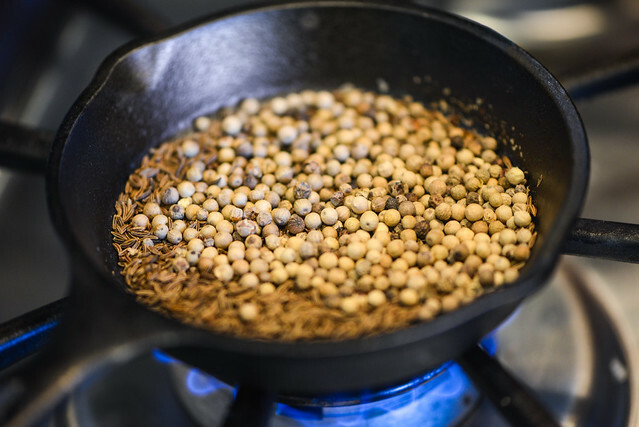 Place white pepper and caraway seeds in a small skillet over medium-low and toast until fragrant, about 1 minute. Transfer spices to a spice grinder and pulse until coarsely ground. Transfer to a small bowl and mix in salt, thyme, garlic powder, and baking powder. Pat pork shanks dry with a paper towel. 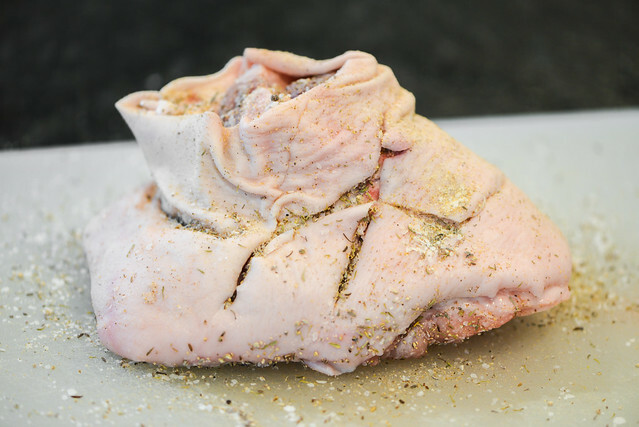 Score the skin of the pork diagonally every 2-inches, repeat in the opposite direction, making a diamond pattern. Season shanks all over with seasoning mixture. Fire up smoker or grill to 225°F. 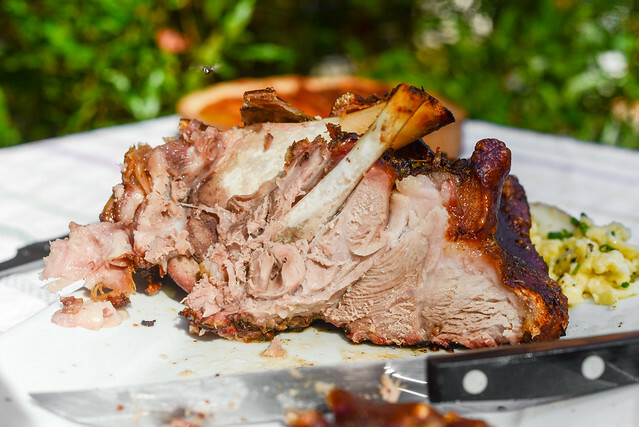 When the wood is ignited and producing smoke, place the pork shanks in the smoker or grill and cook until an instant read thermometer registers between 187-200°F when inserted into center of meat, about 6 to 8 hours. 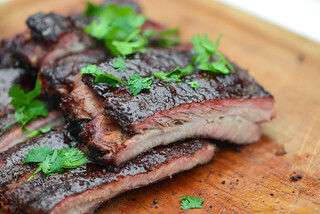 Remove pork from smoker and let rest while preparing the grill. Light one chimney full of charcoal. When all the charcoal is lit and covered with gray ash, pour out and arrange the coals on either side of the charcoal grate and place a foil pan between the two piles of coals. Cover grill and allow to preheat for 5 minutes. 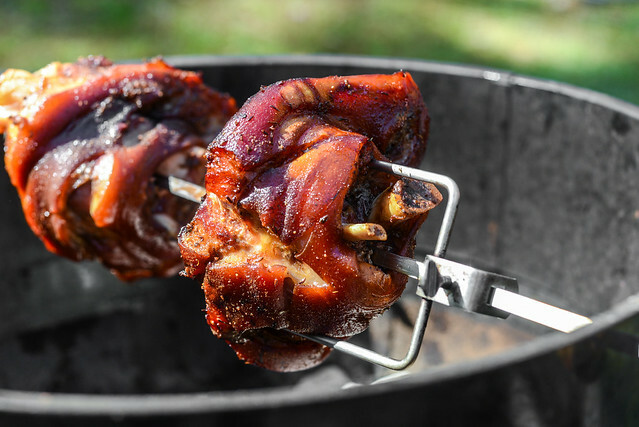 Run spit of rotisserie through middle of pork shanks and secure with rotisserie forks. Place on the rotisserie, cover, and cook at high heat until skin has crisped all over, about 10-15 minutes. 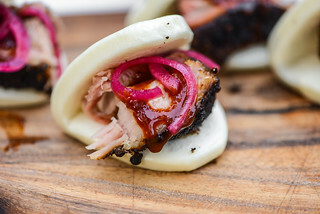 Remove pork from grill and spit and serve immediately. i bought grill a few day ago and i was trying to find some good recipes and this info caught my eyes. I will definitely cook this meat on my grill. Thank you for that info.